This study aims to investigate the genes encoding prolactin (PRL) and prolactin receptors (PRLR) and their tissue-specific expression in starry flounder Platichthys stellatus. Starry flounder PRL gene consisting of five exons encodes an ORF of 212 amino acid residue comprised of a putative signal peptide of 24 amino acids and a mature protein of 188 amino acids. 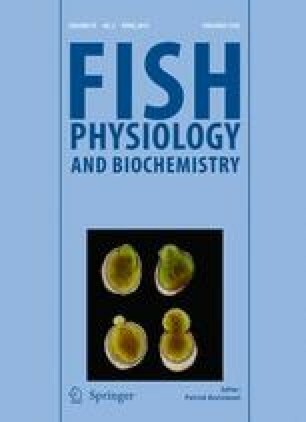 It showed amino acid identities of 73 % with tuna Thunnus thynnus, 71 % with black porgy Acanthopagrus schlegelii, 69 % with Nile tilapia Oreochromis niloticus, 64 % with pufferfish Takifugu rubripes, 63 % with rainbow trout Oncorhynchus mykiss, and 60 % with mangrove rivulus Kryptolebias marmoratus. Phylogenetic analysis of piscine PRLs also demonstrated a similarity between starry flounder and other teleosts but with a broad distinction from non-teleost PRLs. PRLR gene consists of eight exons encoding a protein of 528 amino acid residues. It showed a similarity to the PRLR2 subtype as reflected by amino acid identities of 54 % with A. schlegelii, 48.1 % with K. marmoratus, 46.3 % with tilapia O. mossambicus, and 46.1 % with O. niloticus PRLR2 as compared to PRLR1 isoform having less than 30 % identities. While mRNA transcript corresponding to PRL was detected only from the pituitary, most of PRLR mRNA was detected in the gill, kidney, and intestine, with a small amount in the ovary. The level of PRL transcript progressively increased during 6 days of acclimation to freshwater and then decreased but stayed higher than that of seawater at 60 days of acclimation. An opposite pattern of changes including a decrease at the beginning of the acclimation but a slight increase in the level osmolality was found as adaptation continued. The results support the osmoregulatory role of PRL signaling in starry flounder. This work was supported by the project (RP-2012-AQ-049) at the National Fisheries Research and Development Institute. We would like to thank Prof. MS Noh, Dept of Statistics, PKNU, for his help on statistic analysis.